The greatest difference between God and man is that God’s words always hit the nail on the head, and nothing is hidden. So this aspect of God’s disposition can be seen in the first words of today. One aspect is that they expose man’s true colors, and another aspect is that they openly reveal God’s disposition. These are a couple of sources of how God’s words are able to achieve results. However, people do not grasp this, they always just come to know themselves in God’s words but have not “dissected” God. It’s as if they are deeply afraid of offending Him, that God will kill them for their “seriousness.” In fact, when most people eat and drink the word of God, it is from a negative aspect, not a positive aspect. It could be said that people have now begun to “focus on humility and obedience” under the guidance of His words. It can be seen from this that people have started to go to another extreme, from not paying attention to His words toward excessive attention to His words. Yet there has never been a person who has entered in from a positive aspect, and there has never been a person who has truly grasped God’s goal in having man pay attention to His words. It is known from what God says that He doesn’t need to personally experience the life of the church to be able to understand the actual states of all the people in the church, accurately and without error. Because a new method has just been entered into, all people have yet to fully throw off their negative elements; the scent of corpses still wafts throughout the church. It’s as if people have just taken medicine and are still in a daze, and have not yet fully regained consciousness. It’s as if they are still menaced by death, so that they are still in the midst of their terror and they cannot transcend themselves. “Man is a creature without self-knowledge”: This statement is still said based on the method of church building. In the church, although everyone pays attention to God’s words, their natures are still deeply ingrained and they are unable to extricate themselves. This is why God uses the speaking method from the last phase to judge people so that they accept the smiting of God’s words while they are too full of themselves. Even though people underwent five months of refinement in the bottomless pit, their actual state is still one of not knowing God. They are still dissolute—they have just somewhat increased their guardedness toward God. Only in this step do people begin to enter into the way of knowing God’s words, so when making a connection with the essence of God’s words, it’s not hard to see that the previous step of work paved the way for today, and only today is everything being normalized. People’s fatal weakness is liking to separate God’s Spirit from His fleshly self so that they can gain personal freedom, to avoid always being constrained. This is why God describes man as little birds flitting merrily about. This is the actual state of all of mankind. This is what makes it easiest to topple all people, what makes it easiest for them to get lost. It can be seen from this that the work Satan does in mankind is nothing more than this. The more Satan does this in people, the stricter God’s requirements of them are. He requires people to pay attention to His words and Satan works hard to destroy it. God, however, has always reminded people to pay more attention to His words; this is the peak of the war of the spiritual world. It can be put this way: What God wants to do in man is just what Satan wants to destroy, and what Satan wants to destroy is expressed through man without being hidden at all. What God does in people has clear demonstrations—their conditions are getting better and better. Satan’s destruction in mankind is also clearly represented—they are more and more depraved and their conditions are sinking lower and lower. If it’s dire enough, they could be captured by Satan. This is the actual condition of the church that has been presented in God’s words, and it is also the actual situation of the spiritual world. It is a reflection of the dynamics of the spiritual world. If people do not have the confidence to cooperate with God, they are in danger of being captured by Satan. This is a fact. If someone is truly able to fully offer up their heart for God to occupy, that is just as God has said: “before Me, he seems to be lying in My embrace, tasting the warmth of My embrace.” This shows that God’s requirements of mankind are not high—He just needs them to rise up and cooperate with Him. Isn’t this an easy and happy thing? And just this one thing has stumped all of the heroes? It’s as if the battlefield generals are made to sit around in a xiu lou[a] doing embroidery—these “heroes” are immobilized by the difficulty and they don’t know what they should do. In whatever aspect God’s requirements of mankind is greatest, it means that Satan’s attacks on mankind will be the most serious in that aspect, and the states of all people are revealed through this. “… which of you, standing before Me, would be as white as the driven snow, as unspotted as pure jade?” All people are still deceiving and concealing something from God; they are still carrying out their own unique shady business. They have not entirely given their hearts over to God’s hands to satisfy Him, but they want to gain His rewards through their own enthusiasm. When people have a delicious meal, they have God standing to one side, leaving Him at their mercy. When people have beautiful clothing, they just stand in front of the mirror enjoying their own beauty, and do not satisfy God from deep in their hearts. When they have standing, when they have luxurious enjoyments, they just sit in their status and begin to enjoy it, but they do not humble themselves because of God’s elevation. Instead, they stand in their high place using their high-sounding words and do not pay attention to God’s presence, nor do they pursue to know God’s preciousness. When people have an idol in their hearts or when their hearts have been seized by someone else, then they had already denied the presence of God, and it’s as if God is an interloper in their hearts. They deeply fear that God will steal away other people’s love for them and they’ll feel lonely. According to God’s intention, there would be nothing on earth that would make people ignore God; even the love between people would not be able to drive God away from that “love.” All earthly things are empty, even the feelings between people that cannot be seen or touched. Without the existence of God, all creatures would return to nothing. On earth, all people have their own things that they love, but there has never been a person who has made God’s words that thing that they love. This determines the degree of people’s understanding of God’s words. Although His words are harsh, people are not injured because they don’t genuinely pay attention to His words, instead they go look at it like a flower. They don’t treat it like fruit to taste themselves, so they do not know the essence of God’s words. “If human beings were genuinely able to see the sharpness of My sword, they would go scurrying like rats into their holes.” Speaking based on the state of a normal person, after reading God’s words they would be stunned, full of shame, and unable to face others. But now people are just the opposite—they use God’s words as a weapon to strike blows against others. They really know no shame! We have been brought into this state along with the words of God: “Within the kingdom, not only do utterances issue forth from My mouth, but My feet tread ceremoniously everywhere upon the ground.” In the war between God and Satan, God is winning every step of the way. He is expanding His work on a large scale throughout the entire universe, and it could be said that His footprints are everywhere, and the signs of His victory can be seen everywhere. In Satan’s schemes, it wants to destroy God’s management by breaking countries apart, but God has utilized this to reorganize the entire universe, but not wipe it out. God does something new every day but people have not been aware of it. People do not pay attention to the dynamics of the spiritual world, so they are unable to see God’s new work. “Within the cosmos, everything becomes new in the radiance of My glory, presenting a heartwarming aspect that ravishes the senses and lifts the spirits, as if man now exists in a heaven beyond the heavens, as conceived in the human imagination, unmolested by Satan, free from the assaults of enemies from outside.” This foretells the joyful scene of the kingdom of Christ on earth, and it also introduces the situation of the third heaven to mankind: There is only the existence of holy things that belong to God without any of the assaults of Satan’s forces. But what is most important is allowing people to see the circumstances of the work on earth of God Himself: Heaven is a new heaven, and following that the earth is also renewed. Because it is life under God’s own guidance, people are all immeasurably happy. In people’s awareness, Satan is mankind’s “prisoner” and they are not at all timid or fearful because of its existence. Because of the direct instruction and guidance from the divine, Satan’s schemes have all turned into nothing, which even proves that it no longer exists, that it has been obliterated by God’s work. That is why it is said that man exists in a heaven beyond the heavens. 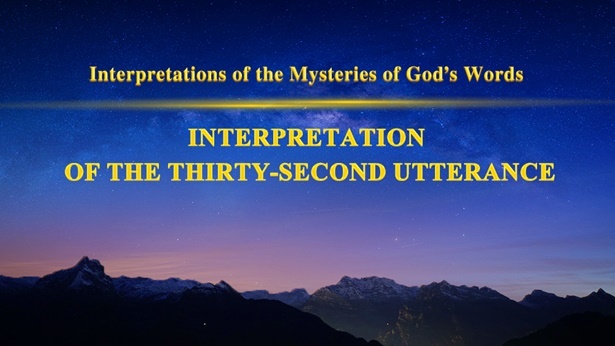 What God said: “No disturbance has ever arisen, nor has the unity of the cosmos ever been broken,” was regarding the condition of the spiritual world. It is the proof with which God proclaims victory to Satan, and it is the sign of God’s final victory. No man can change God’s mind, and no one can know it. Although people have read God’s words and they have examined it with seriousness, no matter what, they are unable to say what its essence is. For example, God said: “I execute flying leaps above the stars, and when the sun shoots forth its rays, I blot out their warmth, sending giant flurries of snowflakes as big as goose feathers drifting down from My hands. But when I change My mind, all the snow melts into a river. In a moment, spring has sprung everywhere beneath the skies, and emerald green transforms the entire landscape upon the earth.” Although people are able to imagine these words in their minds, God’s intention isn’t so simple. When everyone under heaven is in a daze, God utters the voice of salvation, awakening people’s hearts. But because all sorts of disasters are befalling, they feel the bleakness of the world so they all seek death and are in the frigid, icy caves. They are frozen by the chill of huge snowstorms to the point that they cannot survive because there is no warmth on the earth. It is because of people’s corruption that people are killing each other more and more cruelly. And in the church, the majority of people will be swallowed up by the great red dragon in one gulp. After all trials have passed, Satan’s disruptions will be removed. The entire world, in the midst of transformation, will thus be permeated by spring and warmth will cover the world. The world will be full of energy. These are all the steps of the entire management plan. The significance of the “night” that God spoke of refers to when Satan’s madness reaches its peak, which will be during the night. Isn’t that the current situation? Although people all survive under the guidance of God’s light, they are undergoing the misery of the darkness of night. They will live eternally in the midst of a dark night if they cannot escape from Satan’s bonds. Then take a look at the countries on earth: Because of the steps of God’s work, the countries on earth are “running around,” and they are all seeking their own suitable destination. Because God’s day has not yet come, on earth all is still in a state of muddy turbulence. When God openly appears to the entire universe, His glory will fill Mount Zion and all things will be orderly and neat under the arrangement of His hands. God’s words not only speak to today but also foretell tomorrow. Today is the foundation of tomorrow, so people in this current situation are unable to completely understand God’s words. Only after His words have been fully fulfilled will they be able to understand them in their entirety. God’s Spirit fills up all of the space in the universe but He also works within all people. This way, in people’s hearts it’s as if God’s figure is everywhere, and every place contains the work of His Spirit. Indeed, God’s appearance in the flesh is to conquer these examples of Satan and in the end to obtain them. But while working in the flesh, the Spirit is also cooperating with the flesh to transform these people. It can be said that God’s deeds extend throughout the entire world and that His Spirit fills the whole universe, but because of the steps of His work, those who do evil have not been punished, while those who do good have not been rewarded. So, His deeds have not been appreciated by all the people on earth. God is both above and within all things, and even more, He is among all people. This is sufficient to show the actual existence of God. Because He has not openly appeared to mankind, people have developed illusions such as: “As far as humanity is concerned, I seem to have real existence, and yet I seem also not to have being.” Up until now, out of all those who believe in God, none are utterly, one hundred percent certain that God truly exists. They are all three parts doubt and two parts belief. This is the actual situation for mankind. People now are all in the following circumstance: They believe that there is a God, but they have not seen Him. Or, they do not believe that there is a God, but there are many difficulties that cannot be resolved by mankind. It seems there is always something entangling them that they cannot escape from. Even though they believe in God, it seems that they always feel a bit of vagueness. But if they don’t believe, they would be afraid of losing out if it actually is true. This is their ambivalence. “For the sake of My name, for the sake of My Spirit, for the sake of My whole plan of management—who is able to offer up all the strength in his body?” And He also said: “Today, when the kingdom is in the world of men, is the time that I have come in person into the world of men. Is there anyone who could, intrepidly, go into the battlefield in My behalf?” The goal of God’s words is this: If it weren’t for God in the flesh directly doing His divine work, or if it weren’t for God incarnate but He worked through ministers, then God would never be able to conquer the great red dragon, and He would not be able to reign as King among mankind. Mankind would be unable to know God Himself in reality, so it would still be Satan’s reign. Thus, this stage of work must be done personally through the incarnate flesh of God. If the flesh were changed then this stage of the plan could never be completed because the significance and the essence of different flesh is not the same. People can only understand the literal meaning of these words because God grasps the root. God said: “But, when all is said and done, there is no one who understands whether this is the working of the Spirit, or a function of the flesh. This one thing alone is sufficient for man to experience in minute detail through the course of a lifetime.” People have been continually corrupted by Satan for a number of years, and they lost perception of spiritual matters long ago. For this reason just one sentence of God’s words is like a feast for people’s eyes. Because of the distance between the Spirit and spirits, all those who believe in God have a sense of longing for Him, and are all willing to become closer and to pour out their hearts, yet they don’t dare to come into contact with Him, and they just remain in awe. This is the power of attraction of the Spirit. Because God is a God for people to love, and in Him there are infinite elements for them to love, people all love Him and they all want to confide in Him. In truth, everyone has a heart of love for God, it is just Satan’s disruption that has made numb, dull-witted, pitiful people unable to know God. This is why God spoke out mankind’s true feelings toward God: “Man has never despised Me in his heart’s innermost reaches; rather, he cleaves to Me in the depths of his spirit. … My reality renders man at a loss, dumbfounded and perplexed, and yet he is willing to accept it all.” This is the actual condition deep in the hearts of those who believe in God. When people truly know God they will naturally have a different attitude toward Him, and they will be able to utter praises from deep in their hearts because of the role of the spirit. God is deep in the spirits of all people, but because of the corruption of Satan they have confused God with Satan. God today works from this very aspect, and this has been the focus of the battle of the spiritual world from start to finish. a. A xiu lou was a place particularly used for women to do embroidery in ancient China.